If there's one thing all these crime-fighting characters had in common (with the exception of the more down-to-earth Blackie), it was a sly urbanity coupled with a dry wit and a penchant for even drier martinis. Those who grew up with Raymond Burr's stolid but dull Perry Mason might be surprised by the 1930s B films featuring the same character. None of the others - Vance, Lone Wolf, or The Falcon - made it out of the '50s and have faded from view in pop culture. But during the '30s, these films were reliable and popular staples for their respective studios: Vance for Paramount, Warner Bros and PRC, Lone Wolf (Michael Lanyard) at Columbia and The Falcon (otherwise known as the brothers Lawrence) at RKO. Watch enough Turner Classic Movies and you'll soon become familiar with the characters. You'll also get very confused, as a select group of actors switched back and forth between the same roles! William Powell is best remembered today as Nick Charles, husband of Nora (Myrna Loy), master of Asta, and father of Nick, Jr. (played by Dean Stockwell in the series' lamentable last entry in 1947). 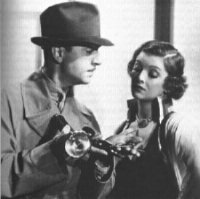 But Powell had honed his suave comedic skills in the role of S.S. Van Dine's Philo Vance in four excellent mystery features between 1929 and 1933. It's likely that Powell's performances as Vance were noted by the talent scouts at MGM, who wooed the actor from the grittier confines of Warner Bros. shortly after The Kennel Murder Case in 1933. Looking to watch the latest movies on a brand new television? Our selection of LCD TVs will have you watching films on the big screen in no time! Warner needed a replacement for the Vance series, and found one in-house in the person of the equally-talented and long-forgotten Warren William. William had played Perry Mason for the Bros. in The Case of the Howling Dog, and immediately moved over to the Vance role for The Dragon Murder Case. William bore a physical resemblance to Powell, down to the receding hairline and pencil-thin moustache. He spoke with the same smooth British stage accent, no doubt acquired by the Minnesota-born actor during his time at the American Academy of Dramatic Arts (Powell had also been a stage actor since 1912). William was usually more the rake and less the gentleman than Powell, but he fit the role well. Warner obviously preferred him as Mason, however, as he returned to play the world's most famous lawyer three more times in the next two years, and wouldn't return to play Vance until 1939 in the unfortunately-titled Gracie Allen Murder Case. In the interim, Paul Lukas, Edmund Lowe, and Grant Richards each essayed the role once. Yorkshireman James Stephenson acquitted himself reasonably well in 1940's Calling Philo Vance, and then the character petered out on Poverty Row, as the dull Alan Curtis completed the cycle with two late-'40s bill-fillers for PRC. William moved on from playing Vance to playing Michael Lanyard, the Lone Wolf, a character created by, believe it or not, one Louis Joseph Vance! The character first reached the screen in 1917's The Lone Wolf, played by Bert Lytell. Except for a brief break for 1919's The False Face, where Lanyard was played by Henry B. Walthall, the star of D.W. Griffith's magnificent and controversial Birth of a Nation, Lytell played the Wolf periodically until the end of the silent era. The character languished unused until 1935, when yet another actor with a pencil-thin moustache, Melvyn Douglas, stepped in for a one-off. Douglas was followed by the great Hungarian actor, Francis Lederer, for one film, and then William arrived on the scene. The transition from Vance to Lanyard was a smooth one, as William basically played the two characters identically. William made nine Lone Wolf features for Columbia, until his declining health led to the studio replacing him with the less-attractive and less-skilled Gerald Mohr. The series started to peter out and after one last gasp in 1949 with Australian Ron Randell, the Lone Wolf was done. And then there's the Falcon. George Sanders was a refined Englishman who first brought Leslie Charteris' character, Simon Templar (AKA The Saint), to the screen in a series of RKO actioners. Sanders filled the Saint's shoes for five average-but-entertaining films before RKO developed the character of Gay Lawrence. Yes, that is the character's name. Created by Michael Arlen, the Hollywood nom de plume of a Bulgarian immigrant born Dikran Kuyumjian, the Falcon would have a relatively long screen life, extending into the late '40s. Gay was witty, urbane, and, of course, a dedicated ladies' man. Sanders fit the role magnificently, but his star was on the rise in Tinsel Town, and he was soon on the move to the more upscale Fox. RKO knew the Falcon was a winner, though, so in the series' fourth entry a convenient brother, Tom Lawrence, was introduced to replace Gay. And who was chosen to play this character? None other than Tom Conway, the real-life brother of George Sanders. Conway was a carbon copy of his brother, with all the requisite burdens: he wasn't quite as handsome and he wasn't quite as good an actor. But he was good enough to keep the series rolling along for another ten films before RKO dropped the curtain on the Lawrence brothers. Not to be deterred, the character of the Falcon continued for three more pictures at the eponymous Falcon Pictures, where a completely new actor, the otherwise-unheralded John Calvert, played a new Falcon, now called Michael Waring. These films are pale imitations indeed of the RKO series, and really can't be recommended to any but the most devout of film fans. These characters, all basically good men with a taste for women and the high life, lost favor in the post-war period. America was coming to grips with the problems of the Cold War and harder men were needed to confront harder problems: Communism, juvenile delinquency, and race relations. Mike Hammer became America's two-fisted PI, a man who was more likely to bed his lady friends than to regale them with witty banter. The era of the suave, sophisticated amateur investigator was over. The films, of course, are now staples on Turner Classic Movies, in the way they were once staples of the movie palace; bottom-of-the-bill fare that fills scheduling gaps and provides an hour or so of painless and pleasant entertainment. So hoist your highball, and salute those masters of the martini and the actors who brought them to the big and small screens. They may be gone, but they're surely not forgotten.